Guests from as far away as New York and Illinois gathered Saturday evening for the wedding of Alice and Kevin. Both the ceremony and reception were hosted at the Double Tree by Hilton Portland hotel. Glittery gold accented the color pallet of ivory, peach and black which was carried out in gowns, bouquets, decor and a sparkling candy station. The ceremony featured a glass sand unity ritual – the blended sand to be used by the groom to craft a signature piece of art. After the ceremony, guests were invited to enjoy an open bar and hors d’oeuvres buffet which included mouth watering treats such as crab cakes and corn fritters. A lavish dinner buffet followed featuring Northwest salads, stuffed pasta, chicken, roast pork and a prime rib carving station. Entertainment included a photo booth and DJ tunes. In addition to the build-your-own candy box, each guest selected a succulent to take home (complete with “how to care for” instructions) courtesy of the family succulent farm. After a honeymoon in Cancun, the newlyweds return to Portland where Alice works in retail management and Kevin is a glass artist. Congratulations, Mr. and Mrs. Murray! May your marriage be blessed with light and laughter. Yesterday’s outdoor wedding for Sam and Anna took place at Lolich Farm and was one of the hottest on record: 102 degrees! The only thing higher than the temperature was the spirit of fun among the guests. Everyone was smiling despite the heat. The groom’s Mom gifted the couple with the planning services of Allison Sims who, along with her trusted Reverie team, turned the blueberry gardens into an even more charming and colorful party venue. The ceremony was enhanced by gorgeous floral arrangements, acoustic fiddle and guitar and a processional across a wooden bridge. Bridesmaids wore varying pastel shades with groomsmen in matching pastel ties accenting their gray tuxes. The bride glowed in her champagne and ivory lace sweetheart gown. 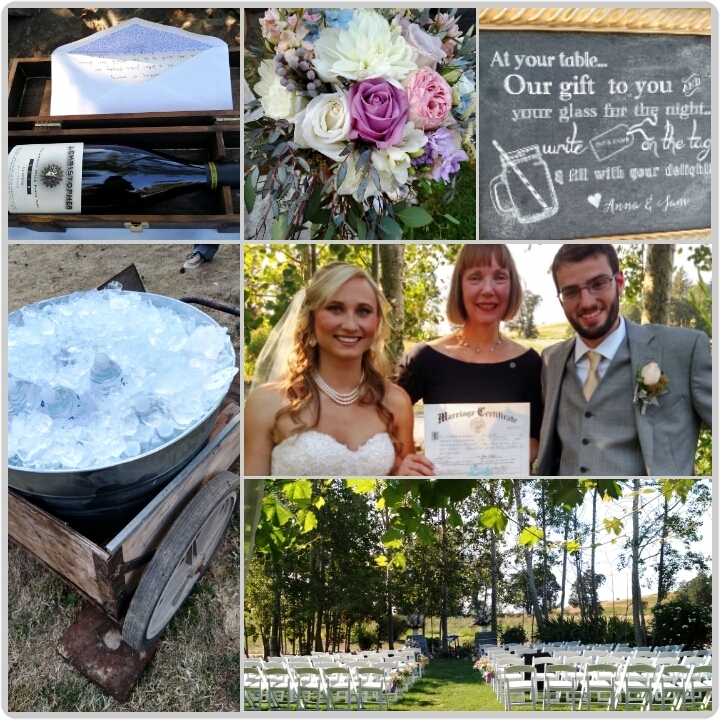 For their unity ritual, the couple created a keepsake box which included love letters and a bottle of Eola-Amity Hills Pinot Noir. Following the ceremony, guests cooled off with iced drinks including a mojito punch made by Anna that morning. Appetizers (scrumptious caprese skewers with the largest basil leaves ever) and a barbeque buffet were provided by Divine Catering. Following a honeymoon in the Dominican Republic, the newlyweds return to their home in Austin, TX. Congratulations, Mr. and Mrs. Elsass! May each day of married life enrich the love and joy that you hold in your hearts today. The Crown Ballroom in downtown PDX provided glitz and glamour at last night’s wedding for Danielle and Justin. Dean Martin’s classic “Ain’t That A Kick In The Head?” serenaded the newlyweds back down the aisle as guests cheered. Opulent decor and smiling hearts – a perfect combo. After a Hawaiian honeymoon, the sweethearts return to their mutual careers in finance. Congratulations, Danielle Justine and Justin Daniel … you are truly a class act! Click here to see slide show.